Since we reached the hotel late last night, I only got the chance to take a good look a Mena House Hotel in the morning while I was rushing for breakfast. 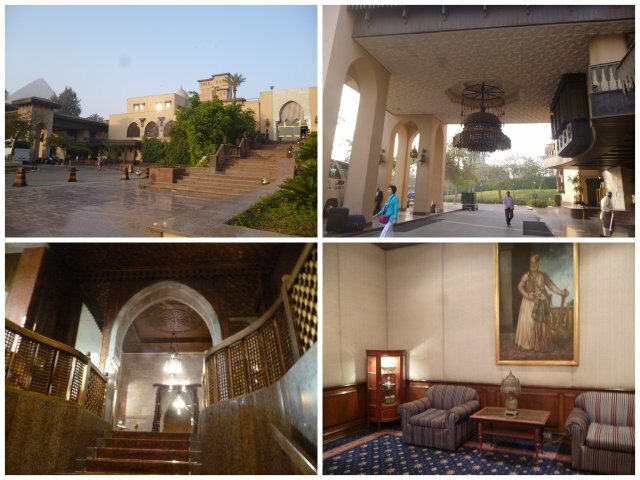 The hotel was previously a palace for King Faruq. The wing we stayed in was newly built. The original wing, which was also where the check in counter and restaurants were, is really gorgeous. Outside of the entrance hung a huge oriental-looking chandelier. Inside the building, some of the walls were covered with cool marbles and reception area had many parts gilded in gold. Breakfast itself was alright with the normal western food. I did drink three short glasses of hibiscus juice. When made right (meaning lots of sugar), hibiscus juice tastes like cranberry juice and even looks like it with its bright red color. It’s a really rare chance for me to stay in a 5-star hotel while travelling on my own. I think it’s a combination of a drop in the number of tourists and being in a tour group that allowed me to live luxuriously for a night. We left at 7:00am and headed straight to the Citadel of Salah Al-Din. From afar, the mosque reminded me of the famous Blue Mosque in Istanbul. I didn’t dare voice that out loud in case it looked completely different and I look like a fool. 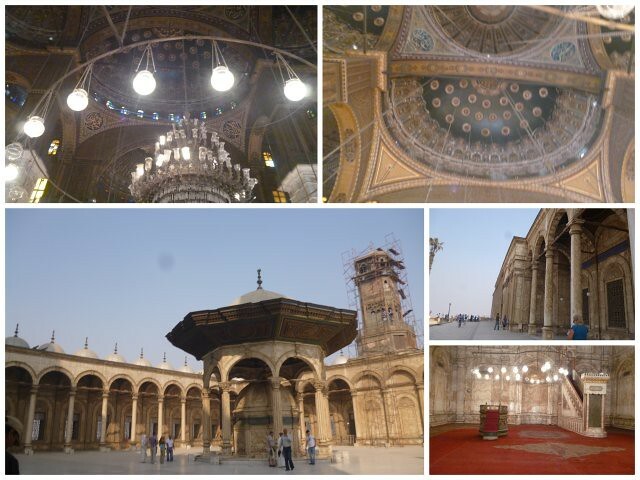 It turned out that the mosque was indeed a copy of the Blue Mosque and was made by the same architect. We had to chance to take gorgeous photos of the mosque. I was kind of stunned. Is that how you determine nationality? By the waving of hands? I replied in Japanese and English that he was wrong. I said, “No. Two dollars for answer.” I stretched out my hand for the money. “I don’t want your souvenirs neither,” I retorted and continued taking my photo. A while later, he came back and said, “You ARE Japanese.” With a dramatic turn, he walked off which kind of reminds me of the crazy drunk in Paris. 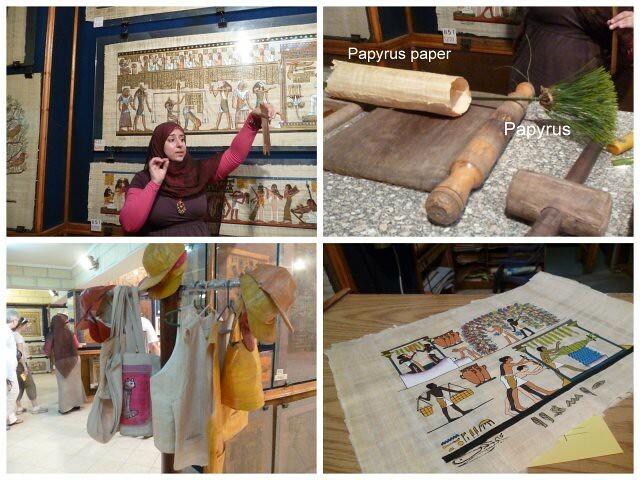 Among our stops today was the Old Papyrus Museum which I loved. Inside, we were shown how papyrus paper is made. Peel off green skin of papyrus for the flesh inside. Take strips of papyrus flesh and soak in water. After 7 days, you will get white strips. For darker strips, soak for 10 days. (Remember to change water everyday to remove the suagr). Line up de-sugared strips horizontally and vertically. Put the strips between two piece of cloth to soak up the water. Put the papyrus/cotton burger in a press to get rid of water. Change cotton burger everyday for 10 (?) days. The sugar and natural chemicals in papyrus will stick the strips together. Voila! You have papyrus paper. The papyrus paper I touched was a lot thicker than regular paper. I heard that you can even wash the paper. The shop also has “royal paper” which allows you to crumble up the paper but it will bounce back to normal. There are also caps and vests made from papyrus. In the end, I bought a few souvenir papyrus drawings to use up my Egyptian pounds. 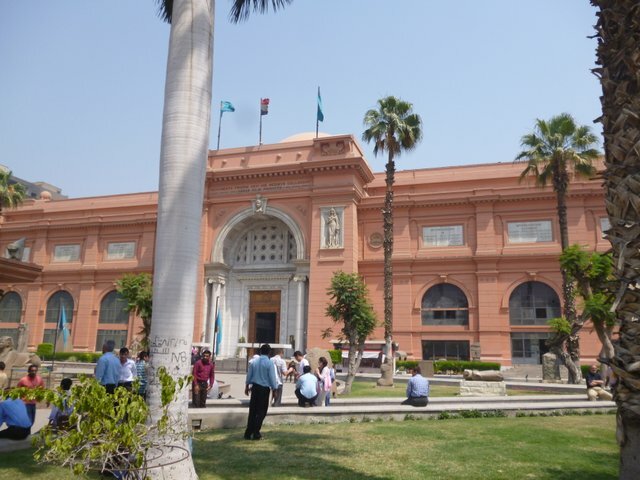 The highlight of today was the Egyptian Museum. We could not bring our cameras inside so I am not able to share with you the goodies. The museum is only 2-storey high but it was packed with antiques. Rows and rows of mummy coffins; tiny pendants all in 15 rows (! ), dried up mummies, wall carvings and so on. Many of the galleries featured wall carvings chiselled off ancient walls. Hieroglyphic is really cute. On our way back, we were caught in a traffic jam. For a while, it seemed that we might miss our curfew to get back on the ship. Thank Amun-re that we made it on time in the end. ” said, “No. Two dollars for answer.” I stretched out my hand for the money. Hilarious! Haha. Very smart move. I’ve been reading your blog for a while now and am really enjoying it!